On June 23rd, BC Alliance for Healthy Living together with our partners at the Real Estate Foundation of BC hosted an exciting webinar on healthier built environments. 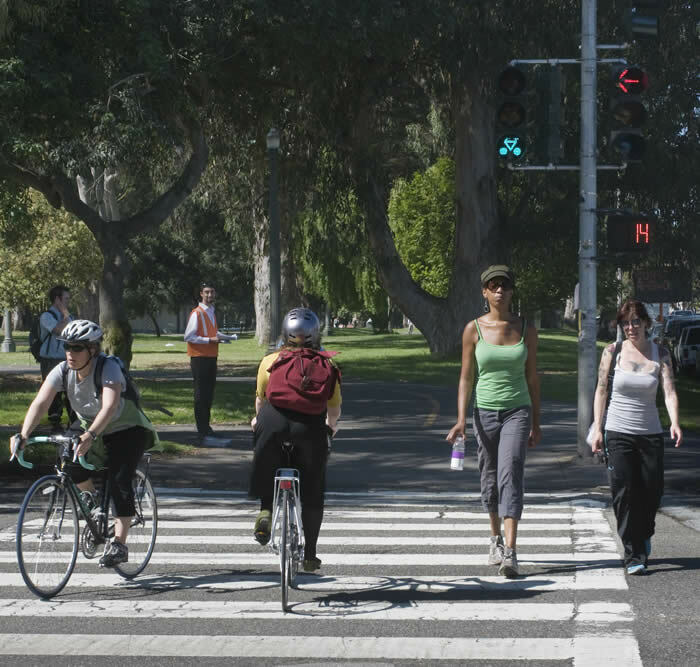 Given that communities that make walking and biking more convenient and comfortable for people also make it easier for people to be healthier. The webinar focused on research and tools that can help build support for healthier communities. Angus McAllister laid the context with his presentation on public opinions and attitudes on built environments based on research done for the Sustainable Built Environment Initiative of the Real Estate Foundation of BC. To get a strong understanding of opinions that would be reflective of the actual demographics of the province, they surveyed over 1000 British Columbians. The first questions were intended to gauge how people felt about their neighbourhoods in communities across the province. The majority were positive, eight out of ten rated their community somewhere between excellent and good. Interestingly, in smaller cities outside the lower mainland and communities on Vancouver Island were more likely to rate their neighbourhood and community as very high. In terms of dissatisfaction, most agreed that it came down to transportation infrastructure, sprawl and traffic. Highly correlated with dissatisfaction in urban and suburban areas and with traffic was noise levels. There were also some significant age differences in community satisfaction but also in terms of what are the important issues and solutions to making communities more livable. Retirees were more positive but younger folks were less positive about their community – rating it as ok or mediocre. Older people wanted better shopping and roads and were more skeptical about climate change. Younger people, under 45, saw climate change as an important issue and wanted more access to greenspaces and opportunities to bike, walk and be active. You can also read the REFBC’s Public Views on Sustainability and the Built Environment Full Report or the Highlights of Findings. Dr. Kay Teschke who is a Professor in the School of Population and Public Health at UBC where she founded Cycling in Cities program of research in 2004, explained what her research says about which types of bike facilities are safer and which ones motivate more people to start biking. Interestingly, there is a strong correlation between the routes that encourage us to travel by bike and the routes that keep us safe from injury. Busy streets, with parked cars and traffic at speeds over 50km/hr, even with some painted lanes and signage, were the worst for getting people to bike; and, these were also the places that had some of the worst risk for injury. In terms of safety and actual injuries, separated bike routes (also called cycle tracks) reduced injury risk by 90% and was the only route type that actually motivated people to cycle on a busy street including women and children. Quiet streets reduce injury by 50% but were somewhat neutral in their ability to motivate biking. However, designating a quiet street as a cycling route made it a strong motivator and with the addition of ‘traffic diverters (or street calming) also reduced risk of injury by 70%. Surprisingly, bike paths and multi-user paths that are bigger motivators, are not always as safe as other route types. This presentation had some great lessons for planners and those of us who are looking to build healthier communities. In the final presentation, Janet Rerecich walked through some of the online resources and tools that were developed through BCRPA’s BEAT project (Built Environment and Active Transportation). The Neighbourhood Assessment Tool is a great first step for communities to analyze what is happening on the ground – where are there gaps in their built environment and how to set priorities for moving ahead. For example: New Westminster used the BEAT funds to do a comprehensive ‘wheelability study’ to assess the features that make it difficult for people in wheelchairs or mobility devices to get around. They have since made improvements in their sidewalks to increase accessibility in the community. Janet highlighted how some smaller communities such Qualicum Beach and Invermere were able to build on the Active Transportation plans they developed with BEAT seed funding and leverage 100s of thousands in infrastructure funding to complete paths and build out their network. Other small communities such as in Sparwood, Rossland and Armstrong have continued to build momentum and support by incorporating many of the plans and recommendations into their Official Community Plans. The BEAT website also includes sample Active Transportation Plans, and a ‘Healthy-in-Nature’ portal as well as an area for people to engage in on-line discussions with others about building healthier, more active communities.